and aspiring students have graced the Deertrees stage. ​to make her dream come true on the site of an old deer run just outside of the town. Ms. Dillon enlisted the help of New York designer Harrison Wiseman and three years an acoustically perfect theatre in one of the nation's most idyllic locations, was born. 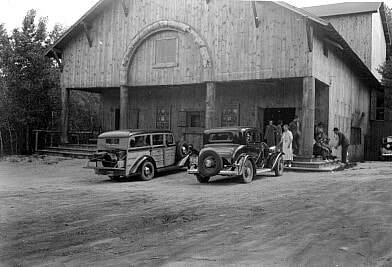 The 350-seat theatre was built of rose hemlock harvested from the property and featured hand-carved beams, doors, trim and light fixtures. Inside the theatre was a lighting system surpassed only by theaters in New York City and a stage area comparable to that of the Metropolitan Opera House. The construction cost was over $60,000, a phenomenal sum in those days. On August 15, 1936, Deertrees was christened with a bottle of champagne as the curtain went up and quickly gained its reputation as “Maine’s most enchanting theatre”. However, 1941 brought about the end of a short-lived era and due to World War II the theatre kept Deertrees closed until 1946. The late '40's found New York attorney, A.L. Sainer, as producer, with his son-in-law Robert Harris as director. Together they hosted a resident summer stock company that thrived until the early 1950’s In 1954 Deertrees was purchased by Sherwood Keith, founder of the Boothbay Playhouse, who, for two summers, presented a weekly offering of shows performed by outstanding community theater groups from all over New England. Mrs. Aya Sholley acquired Deertrees in 1956 and leased the facility to various production companies and concert organizations until 1965. In 1965 Mrs. Sholley presented the deed to Deertrees to her alma mater, Emerson College, for use as a summer training center for students. Directed by Michael Rutenburg, the Emerson College company performed a variety of productions ranging from serious drama to musical comedy. The facility, with a full staff of college instructors, offered college credits to students who lived on the recently expanded grounds in 20 waterfront cabins. In 1969, former Emerson student, David Maturi, bought Deertrees from the college for $9,000 and with Alfred Corono founded the Coventry Center for the Performing Arts. But after 1979 the theatre again went dark. By the 1980's the building had fallen into serious disrepair and porcupines were the only visitors. The town of Harrison had gained title to the property in lieu of taxes and, under the leadership of Dr. Allan Mills, a group of concerned citizens applied to create a non-profit foundation to save the theatre and recreate the climate in which Deertrees originally thrived. At first, performances were staged on the theatre’s front porch as the building was considered unsafe for occupancy but by the early 1990’s restoration allowed the original stage to be used again. Salt Lick Cafe, the magic of Deertrees continues.